I also need the daily excitement of seeing plants grow in the winter. Your sense of pride in the garden is different when you have grown the plants, and each year you learn new things as growing conditions change. Of course, it is great in winter to browse seed catalogues, imagine your garden and make selections, although there are dangers in ordering too many seed packets, your garden is not infinite in size. How many plants do you want of each vegetable? Such choices are particularly challenging when choosing tomato varieties. You will learn from experience after you plant too many of everything and probably plant them too closely together. Avoid too many cherry tomato plants since each one will flood you with tomatoes, unless your dog likes them or your kids eat them by the handful in the garden. Can you ever have too many sugar snap peas? I never seem to have enough because most get eaten in the garden. I think of radishes as bonus plants that fit in anywhere and finish up quickly so plant lots. I plant them around my squash seedlings as they are supposed to deter squash borers…I can always hope, and I do get more radishes that way. Arugula also fits in very small spaces and is the zinnia of the vegetable world…easy is the word. Pinetree Garden Seeds (www.superseeds.com) is my “go to” catalogue because the packets are cheaper and directed to the home gardener. However, I buy from several other catalogues as well, such as those that specialize in tomatoes. Starting times for particular seeds varies; most greens, beets, carrots and peas should be direct seeded in the garden in early spring as can herbs such as dill and cilantro but wait until the soil is warm to direct seed beans, cucumbers and squash. Tomatoes, eggplants, peppers need to be started indoors, usually in April although take guidance from specific seed packets. Eggplants and peppers seem to need two weeks longer than tomatoes which grow more quickly (see link for a more comprehensive chart of seed starting times http://awaytogarden.com/when-to-start-seeds-calculator/ ). Onions and leeks should be started in February. Sometimes seeds need special treatment to germinate, i.e., soak parsley overnight to speed germination. A simple set up in your basement or an unused room works effectively for starting seeds. First, set up 4 foot shop lights on chains above a table or shelf; the chains need to be longer than the ones that come with the lights so that you can raise and lower the lights to just 3-4 inches above the seedlings as they grow. Hardware stores can cut the desired length. An eye hook or cup hook can hold the light fixtures; decide on how many lights you need based on how many trays of seedlings (a tray holds six 6 packs) you wish to plant. One light covers 2 trays. Use one warm and one cool fluorescent bulb for each light fixture to replicate the full light spectrum and plug the light into a timer set for 16 hours; special grow lights are not necessary. Even a Southern window exposure does not provide adequate light for seedlings as effectively as shop lights. I use a germination tray for starting seeds; each of its 20 channels is planted with one type of seed and covered with a clear dome top; the germination tray (or whatever container you use) is filled with a sterilized growing mix such as Pro-Mix; seed starting mixtures are available at garden centers. Since I use quite a bit, I buy a bale of Pro-Mix and moisten the mix by pouring water into the bale so it is ready to put into the 6 packs. I transplant seedlings from the germination tray into 6 packs (I prefer open 6 packs-those without cells) or larger pots when the seedlings have their first true leaves or when they reach the dome top. You can remove the dome top after germination if the trays seem very damp. You can also plant directly into 6 packs or into other containers such as yogurt cups, if preferred; however, every container must have drainage holes. If you are re-using containers, they should be washed with a 1 to 10 bleach/water solution or 1 c vinegar to 4 c water. See seed packets for information on length of time to germination and for information about any light exposure requirements for germination. Most vegetables seeds need to be covered; I use milled sphagnum moss (available at garden centers) to lightly cover the seeds. It also serves to reduce damping off (soil borne diseases) of seedlings. Seedlings should be checked daily for dryness. A moisture meter can be useful in determining when to water as can observing soil color. 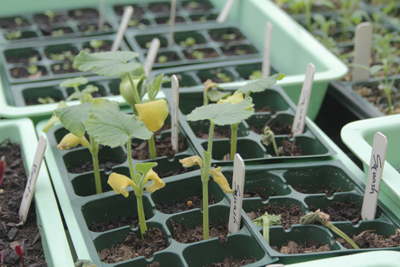 Label each column of the germination tray or each container so you know what you are growing. My basement is warm so I don’t use any additional source of heat to germinate seeds; you may need a special seedling heat mat or put tray on top of refrigerator until germination. Keep seedlings moist with a spray bottle until they are large enough to withstand water from a watering can. I fertilize with fish emulsion weekly. Finally, in April, lettuce and other seedlings that like it cool such as parsley, chard, kale and other greens (if you have started them indoors instead of direct seeding them), will be ready to “harden off” gradually outside before being planted in the garden. Depending on weather, you can move them in and out of the garage or other shelter daily for a week or more or you can make a crude cold frame with old windows and benches or cement blocks; there are also many products on line. I have a wonderful, inexpensive pop up cold frame (https://www.amazon.com/gp/product/B00012D01S/ref=s9_acsd_al_bw_c_x_1_w ) that allows me to unzip a window so that the seedlings don’t get too hot in the sun. Water at least once a day; small containers may need to be watered more frequently. After the hardening off period, in April or early May, you can plant those vegetables that don’t mind cold soil while holding tomatoes, peppers, basil and eggplant until the soil warms, around Memorial Day in W. MA (soil temperature at least 60 degrees and night temperatures no lower than 50 degrees). A useful link to the temperatures at which seeds will germinate in the soil is http://www.gardeners.com/how-to/when-is-it-warm-enough-to-plant/9029.html. Enjoy your harvest!